"Oh, Dakuwaqa!" 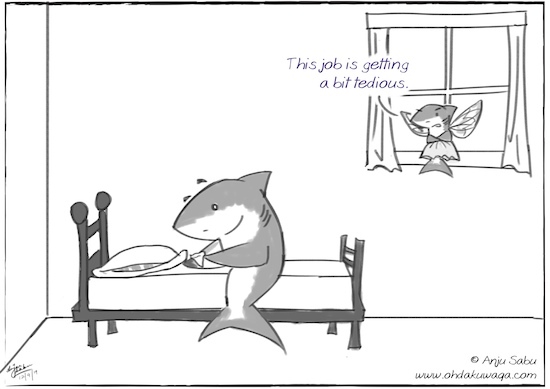 - The Shark comics and cartoons: The Shark Tooth Fairy Quits! The Shark Tooth Fairy Quits! Sharks could make a load of money this way! The Shark Tooth Fairy might go bankrupt though. I was playing around with a few ideas for this - one with The Shark being all industrious and on its way to being a millionaire, another with the regular tooth fairy threatening to quit and finally deciding on a tooth fairy exclusively for the sharks.